Located on the entrance to the Lincoln Cove Marina, The Anchorage Holiday Apartment is a fully self contained luxury 2 storey apartment. Watch the daily passing parade of water craft go past your front door. Enjoy spectacular views of Porter Bay and Boston Island while relaxing on the balcony with a glass of local red. Feeling hungry? - Try to catch your dinner from the front lawn, then cook it on the bbq. Enjoy locally caught seafood from one of the many seafood outlets. Safe sandy swimming beach located 50m from the apartment. Located within close proximity to The Marina Hotel, Cruisers Cafe, the Leisure Centre and scenic walking trails. 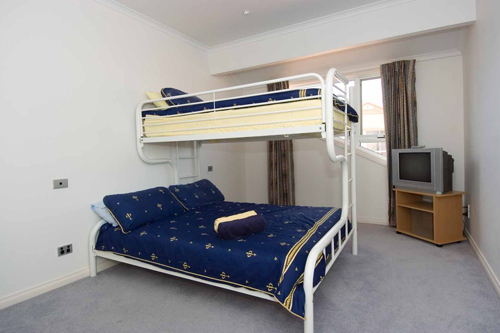 Air conditioning, Bath, BBQ, BBQ - Gas, Boat Ramp Nearby, Books/Magazines Supplied, DVD, Ensuite, Kitchen, Laundry facilities, Linen supplied, No smoking, Pets not allowed, Spa Bath, Tea/Coffee Making Facilities, Television, Undercover or off street parking, VCR, Videos/DVDs Supplied, Playstation 2. Please note, reservations can not be confirmed if accommodation is booked after 5pm on the same day as arrival. Sleeps up to 9 persons. 3 bedrooms, 2 bathrooms. Ensuite bathroom with relaxing spa bath. Fully equipped laundry and kitchen. 3 colour TVs, DVD and Video Library available. Playstation 2 with some games. Downstairs access to lawned area fronting water. Ample parking for boat and trailer located across the road. Once your booking has been confirmed and paid any cancellations will incur the following: cancellations must be given with at least 1 months notice for a full refund. For cancellations with 14 days or less notice only 75% of the full fee will be refunded.